Blackjack turned to Anubis, listening to his report, and nodded. "All right then. You may stay here with us or go do as you please... I think you'll be interested to know that the two greyhounds, Bos and Viator, are also in the scout position with you," he said, and said nothing more of it, as he had no doubt that this would not sit well with the hot-headed little terrier. While he, as the leader, had allowed the two dogs to have the rank, it was a rank they would have to be fighting for if they truly wanted to keep it. Such was the way of the pack. He turned to the two dogs and smiled. "Likewise," he said in response to Jacob saying that he was a Dutch Shepherd. They were very similar in size and shape - dark and large - but more muscle was packed on Jack's build than Jacob's. Regardless, the two before him were obviously of no threat and in fact, very interested as to what was happening in their corner of the world. "I'm glad to hear that you've heard of this place. On my way out of the City, I told the little terrier that smuggled us out to spread the word... I don't know what rumors you've heard, per say, but I can tell you this truth - we are a pack of dogs living in the wilds among wolves," he said. Here, his tone grew heavy and dark, and there was a rather malicious gleam in his eye; the kind of gleam a man got when he thought of spilling blood for pleasure. But why Jack drew pleasure out of the thought of killing wolves was much, much deeper than bloodlust. "But to say that we live peacefully is an understatement. The wolves think dogs as puny and weak - I intend to show them how wrong they are. Call me and the dogs around me a gang, an army, or whatever you wish, but know that our intentions is to slaughter any wolf within our boundaries. Right now, we are small, but as you can see, our numbers are growing. I hope that these cruel intentions hasn't dissuaded either of you from staying for a while." His beetle-black eyes turned to them in curiosity, wondering what they thought. In the back of his mind, Jack was beginning to grow impatient - where was Blue, and why was she taking so long? Jacob looked to the brute who had come over. Another shep. When his maw opened to speak the terrier spoke first and he closed his maw to let the little dog speak. "Jacob." he said answering the dogs question. 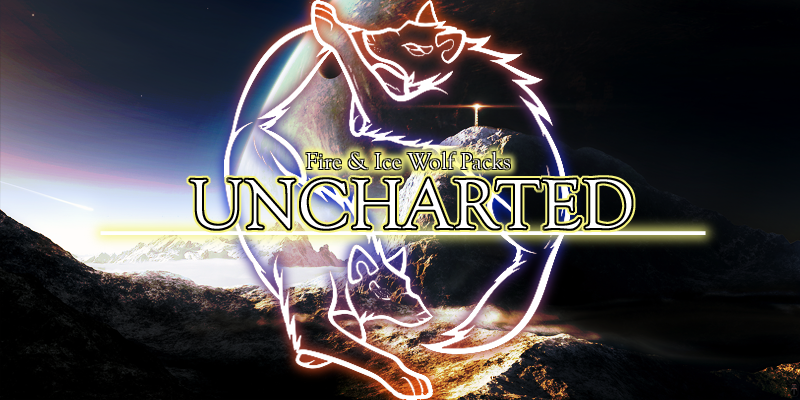 "Dutch Shepherd" He nodded towards his companion and smirked. "Navox. And he's right. Lundehound. Kinda a strange one" He looked around as more wolves started gathering around. "I had heard of this place from distant tales, and then I ran into this runt" again he nodded to the smaller guy but kept looking around. It was Navox who spoke up next stepping up to the bigger dog. Tauro had nested himself in the den he had napped in before, and closed his eyes, quickly drifting away in sleep. It wasn't a dreamless sleep, Tauro never had the luxury of those anymore. He was overlooking over the most desolate and dead wasteland a dog could imagine, dead trees, or what was left of them, stretching out like black claws from the bleak landscape. Holes and craters dotted the land, and bones where scattered everywhere. He himself was sitting in a so-called trench, a man made ditch for troops to shelter in. When he looked to the left, he saw rows of grey clad and helmeted humans, all holding rifles, their bayonets glimmering in the harsh sun. Moving his head, the black colored, spiked collar felt tight around his neck. "Is the dog ready?" came out of the mouth of one of the humans, his neat uniform indicating he was an officer. "Jawohl mein Oberfeldherr." replied the soldier, who holded a chain to keep Tauro in check. A whistle was hear able in the distance. "It is time." The officer grabbed in his pockets, and took a sliver whistle out himself. Whistling in three short tones, the row of soldiers rose up in unison, climbing up, out of the trench. The soldier with the leash and one next to him grabbed Tauro, and placed him on the trench's ridge, the man with the leash climbing up behind him. Tauro pulled on the chain, urging the man forward. "Easy Bulle, what's the hurry!" shouted the man, being dragged forward by the massive dog. Seconds later, the wheezing sound of incoming mortar rounds was audible (for the soldiers, Tauro had noted it far earlier) and the booming sound of 40mm explosive rounds crashing down in the trench behind them, made the man following Tauro's pace. More mortars joined the orchestra of guns spitting and men screaming, variated by the heavy boom of the german howitzers, and the constant rattle of machineguns. Then in the midst of the smoke, the two armies clashed, the fighting blurring to close quarter fighting, and the administration of bayonet to human body. Tauro soon stumbled on his first opponent, and jumped the man, who had been busy reloading his rifle. His jaws clenched themselves around the poor mans throat, and they both fell to the ground, Tauro rising only. His handler crawld up, as Tauro's jump had made him trip, and he had stumbled in the mud. Still on hands and knees, he saw the man choking in his own blood next to him, making gurgling sounds through his crushed windpipe. The german looked back to Tauro, his face a ghost. The man was clearly not used to blood. A mortar round screamed, and all went black for Tauro. That was the point that he waked up, heavily panting. Seeing as there was no point in trying to get any sleep now, he rose up, trying to shrug off the terrors of his dream. Nikita would stand and move toward the gathering of dogs. She saw their leader greeting and speaking to others. She would quietly move herself off to one side and settle her graceful haunches down. Her brown eyes looked for Jack's second, Blue. She was nowhere to bee seen. Her ears perked thoughtfully and she sat and listened to the goings on around her. So many were appearing. It was odd...they were flocking from the city...hearing the promise of a different life. She herself had stumbled upon it purely by accident. Though she missed the warm fire of her master's hearth this held a different sort of satisfaction. Anubis, upon seeing Jack at his side, quipped in his own profile of the two new dogs. “Just a couple of wanders it seems like to me. The lil’ one’s a Norwegian Lundehund and some sort of black Sheppard.” He gave a quick gaze at the newcomers, then directed back towards Jack, as though he was talking about them like they weren’t right in front of him. “I don’t know…I’m not great with breeds, but I’m sure you can tell what they look like with your own two eyes. Their scent says their no threat, but I didn’t catch their names. That’s about as far as I got.” Anubis had not heard Jack’s talk with the two greyhounds. If he had, and learned that they had the possibility to take power over him, he would have been confronting them himself. For now, all was well in his world. Viator nodded to Blackjack. "Thank you so much." Her voice is thick with relief. She turned and headed in the direction of the grove of trees that Blackjack had pointed out. She sped up, going at a trot. Bos followed behind her, slightly slower. The both filled their small stomachs before following Tauro's scent to the dens. The found one that didn't appeared to have been recently used, as their were no scents. They both laid down, and rested their heads. Blackjack turned his head and nodded at Tauro's response. He wondered what he had to say, but at the moment, there were still matters to attend. "If that is the position you both desire, so it shall be," he said to Bos and Viator. He was still curious of what their 'skills' entailed, though they appeared reluctant to say so. He inwardly chuffed. Snooty greyhounds. "Just be aware that Anubis also shares the position of scout, and he is very territorial about it. And, as a gang, you have the option to contend the rank with him. I can give ranks as a leader, but it is ultimately the pack that decides who fits where. Anyways. Make yourselves comfortable. If you didn't have a bite of the elk that was hunted earlier, Tauro has moved the cache to the grove of trees there. I have newcomers to attend," he said, having noticed Anubis making quite the commotion. His large form weaved around the greyhounds and he approached to where a black Shepherd and white, terrier-looking dog were. "What have we here?" Jack said aloud, his tail swishing and his head tall, but not as an arrogant king's; more or less, to show a form of leadership. He glanced at Anubis, wondering if he was going to issue a report, but kept his gaze trained on the two dogs before him. They did not smell of wolves, and thus, there was no reason for to be overly alert. Tauro grinned back. "I'd gladly take both offers." He yawned. "For now I am going to take a rest, there's one thing I wanted to discuss with you, but that can wait, as it seems there's another couple of new ones to." He trotted down from the ledge, and headed for the lo jam's dens, hoping to get a good rest of an hour or two. That year as a gaurd dog had made him lazy, and he knew he would have to do something about it. But that could wait. For now. Barking. Jacob brought his head back as the little dog came racing up to him yapping like a child's play toy. for it. It was the swish of Navox that made him want to growl but the guy did this when nervous. All legs were sticking out and he lay flat, as if doing the splits with all his legs. "And now you're taller" he said to the terrier. "Who's the leader here?" Jacob asked, avoiding the conversation that would erupt between the two smaller of companions. Navox wasn't small... well he was, but he... whatever. Jacob looked around and then back to the terrier. "Because if you're it, what a greeting" he smirked towards the terrier and then felt Navox stand beside him. "I said not to do that. It's freaky." he heard the huff from his friend and chuckled deeply. "There are only dogs here, right?" he asked looking back to the scottish sounding, but highly yappy, dog. Viator looked at her brother. "As Tauro said, we think we might be fit for the scout position. If thats all right with you." She added quickly at the end. She tilted her head as she waited for a responce. Bos nodded to enfisize her point. Both dogs tails were tapping on the ground. Interesting. It all was. Interesting. He hadn't seen quite an established group of dogs before, and so many breeds. His eyes, quick and energetic scanned the area before him. Well this, all of this, would be awkward but it wasn't like he had much of a choice now did he. The patter of a leaf as it fell from a tree made his head jerk to the side. Fighting, no, he was night a fighter, war, not even close he wasn't fit for 'attacking' a wolf as he over heard these dogs doing if the time came, but hunting, he succeed in. And spying, that was his game. "Do you see them?" he said as his companion came forth. He looked up to the 'friend' he had made, though deep inside he didn't trust anyone. Dogs had turned on him before, and though this bru had said he'd protect him with his life, he didn't trust it. "Look at all of them, is this what you had heard about?" the little dog perked his attention up to watch the dogs again, but the bigger canine said nothing and just approached the scene without a care in the world. "Don't say a word" was all the shepherd whispered to the little companion. "And they wont kill you for being annoying" he smirked as the dog's ears folded inwards. "And don't do that either. That's weird" he smirked as he strode forward. His gate was that of tired walking. Wolves, distance wasn't a problem for them, but dogs, they were not made for such long travel. Though they had supposedly descended from the very animal he loathed, he didn't put it past them they had some abilities he didn't. Word had traveled fast of this band they now walked for. And in travels he had met a few scraggling dogs trying to find this safe haven. Not but one, the small bru beside him, had made it. Died along the journey or had given up hope and went a different way. Two males and a female he had met, died back in the gloom of the past. 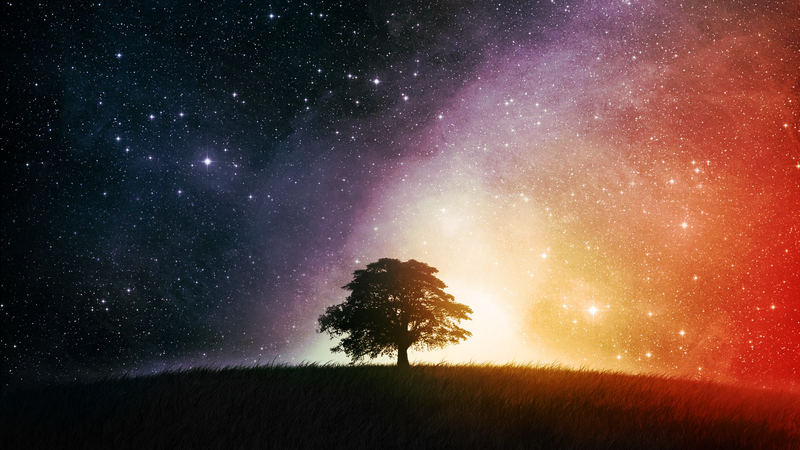 The light of the future, and the ongoing ramblings of this male had kept him from dying. He had hoped someone else would get to put up with him after he had made it. Though now. As they came upon this band, the thought of having to pass him along jerked him a little. The young bru, though he was skilled in only ways a weird dog could be, with his six toes and weird flexible joints, had become annoying... Jacob had come to like the young fellow, though he wouldn't admit that to him. "I see," Blackjack replied, nodding at the leonberger's words. He had the build of a tank and the mind of a soldier, a soldier that he knew he could trust. 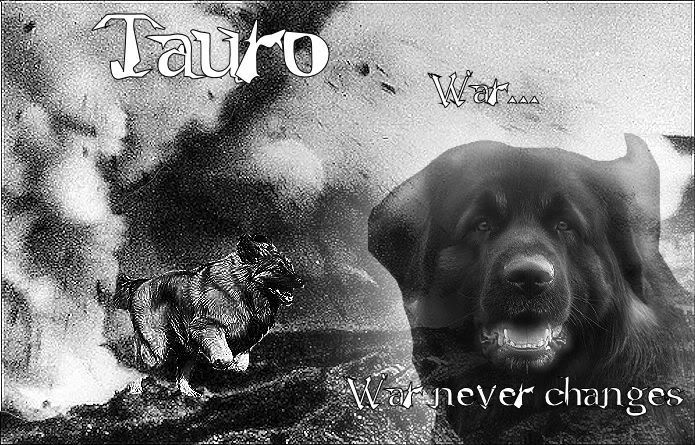 If anything their time in these foreign lands were worthwhile, he had no doubt that Tauro would become the canine that wolves feared to fight because of his formidable size and power. Kane was already a force to be reckoned with, and he knew that the brute carried out his guardian duties best when working by himself. "Experiment with the rank of a soldier, Tauro. I have no doubt that you can teach the group a bit of what you know. Perhaps we can arrange to spar sometime," he said with a wry grin, for he was the kind that couldn't resist a challenge. And, it kept him sharp when things were beginning to dull. Blackjack turned back to the two greyhounds. If they had spoken amongst themselves, he had not heard it. He was not the youngest wolf in the world, afterall, but he was not deaf, either. He knew he was getting old, but there was enough fire in him to keep him going for longer than necessary. "Now," he said to Bos and Viator, his attention undivided. "I hope you've considered what I've said, so I will ask you again. What role do you believe your skills are most suitable for? You do not have to decide now if you do not want to. You may find that you will fall into your rank in time." Tauro grinned. "Depends on who you'd ask." Back in the great wars, he had been used by the humans in many roles; gaurd dog, hunter dog, bomb dog... "It mostly depends on what you want me to do, altough my expertise mostly lies in the art of war." Tauro never thought about what he wanted to do, he was content enough with just the fact people needed him to do things. And he was versatile and experienced enough to adapt at any role quickly enough so he could perform it excellent. Tauro's avoiding answer was more to test Blackjack's leadership skill, as leading actually meant giving people the job they 're good in. Blackjack is still as Tauro sits at his side, finished with moving the kill. He does not mind his presence, and takes the leonberg's words into consideration. "Perhaps," he replies to him, but his obsidian eyes are still on the greyhounds. Viator speaks and he raises a credulous brow, and he barks out a laugh. These dogs, all of them around him, were just getting better and better. He briefly wondered how Blue was faring in the other lands, and hoped that she would return soon, with companions in tow. He continued to look at the greyhounds. "You're going to have to be more specific than that," he said, standing up with a swish of his tail. "Out here, you'll find that not all of your little 'tricks' will work. Like begging at the doors of humans, or pretending to be hit by a car, just so you can receive some food and attention. There are no humans out here. There are wolves, and they won't take to you kindly. They'll eat you before you have the chance to set foot in their lands, no matter how silent you are. They're sharp. We, as dogs, have to prove that we are sharper. Now. I'll let you two think about what more you have to offer before speaking with you again. Yes, you are welcome here, but I need to know your role as well." He gave a quick sweep of the group around him. It was then that he realized that, other than the greyhounds, Tauro was the only one with an unassigned rank. He turned and evaluated the brute, tilting his head, looking over his large, buff form. He was strong, that was for sure... and he seemed to be the kind with a level head. "What rank do you fancy yourself, Tauro?" he asked, not because he was unsure, but because most dogs fell into place with what they did best. And what Tauro did best, exactly, was not quite clear to him. "You seem like a dog of many skills. Which do you think you do best?" OOC: Okay. To clear up any future confusion, Jack is now called Blackjack. This is because there is another Jack over in the Pearl. Don't mind my herp-derping. Viator grins softly. "My brother and I know some tricks to make up for our lack of strength. Plus we know some extra tricks for concealment and silent travel." She wasnt sure if thats what Jack meant, but she figured that would suffice. Tauro returned from his hauling duty just in time to see a small arguement had risen. Approaching from behind Jack, he sttled himself next to the alpha, but a bit lower, as not to detest his leadership. It was a natural habit off him. Eying up the two newcomers, his mind made a sound he almost thought the others could hear. "Well, there's no apparent need for hunters in our little mess..." He paused, taking up the two a little more. "They could be fit for scouting duties. With a little training though." He moved his gaze to Jack to ensure it was only some friendly advice. What would happen to them was up to Jack, but if Jack decided they could stay, Tauro wouldn't mind taking these two under his wing. At the end, that would pay off good for both the pack and Tauro himself. Jack nodded, dark eyes skeptical of the greyhounds, but in a puzzling way more than a distrustful one. "I see that," he said, seeing movement out of the corner of his eye. From what he could tell, Tauro was set to move the remains of the kill on his own, as if to prove his strength. Beside him, Anubis appeared, grumbling sarcastically. Jack chuckled at the terrier's words. "Anubis has a point. I can welcome you into the pack, but I also need to know what value you are to it. Have either of you any skills? The wild isn't a racetrack, you know," he said with a slight smirk, knowing that the greyhound breed was built for speed. Nikita had already proven herself to be the fastest out of all of them, and with the skills of a hunter; he could only wonder what Bos and Viator had to prove that he hadn't already seen. Anubis had stood still against some bushes, watching everything that passed him; he was a fly-on-the-wall. He actually kept his thoughts contained as dogs passed back and forth, and two greyhounds arrived in the lands. He held a low growl to himself, restraining from barking at them for little reason other than their presence. He figured any dog that probably needed a sweater to stay warm was "frilly". Anubis clamped his jaws once Jack had began to welcome them. At Bos's words, he mumbled in sarcasm, "...I just figured you two came for the nice view." It was his version of "Welcome". He had finally revealed where he was standing by speaking; even though he had not been concealing himself in any way, the absence of his usual presence had made him nearly invisible. Bos steps forward. "I am Bos, and this is my sister Viator. It is a pleasure to meet you. We were hoping to join this pack." Viator nods shyly. Nikita was the first of the pack to return. She busied herself by washing the blood out of her coat. Jack watched her with a passive gaze, if not the bit intrusionary, but in a skeptical manner. She had a tall, lithe form, one that was fast and bred for the hunt. She had exerted her speed when chasing the elk herd, and once the rest had returned, he made a mental note as what position to give her in the pack. He turned away from her and found the others returning, with Kane, Tauro, and two unfamiliar greyhounds dragging the elk from the kill site. Jack looked further into the forest, wondering when Anubis would show, but he had no doubt that the terrier would pop up the moment he said his name. Terriers had that habit of doing that. Kane barked for his attention. He bounded over, his form still mottled with mud, and nodded to the Rhodesian. "There's a dry patch near a grove of trees over there, heavily scented," he said, pointing his muzzle a few paces ahead of them, downriver. The trees were a mixture of white birch and pine, and had managed to survive the tempest that had decimated the landscape. It was a place where most of the wolves would be able to access without being far from the dens, but not so far that other creatures would get into it when left unguarded. "I've determined that it's a good place to start a cache. When we hunt in the future, we'll store the meat there as well. Tauro, come back when you are finished. Kane, you may go and continue your patrol." Jack turned to the pair of greyhounds. He was surprised, really, to see such a lithe breed out in the rugged wilderness. If they had been in the City, he wouldn't have given them a second glance. But they were of dog blood, and that was all that mattered to him. "Welcome," he said to them, his voice still coarse, but warmer than newcomers prior to them. Again, though, it was all because they were of dog blood. "I am Jack, king of this land. The wolves called it something else, but it doesn't matter because they don't live here anymore. We do. How can we help you?" Soon enough they were reached the area everyone else had mingled at. Dropping the carcass he signaled for the others to do the same. It was up to Jack to delegate where they would store their extra meat and to deal with these grey hounds. He threw a couple low deep barks across the area letting Jack know that he needed to attend to new dogs. It was interesting to see what kind of breeds were showing up. He expected to see more mutts...but then again mutts were street dogs, too mixed to remember how to live in the wild. He stood waiting patiently, though he didn't really need to wait here any longer. Kane licked his chops and yawned.